Poetry and Magic(2): Ted Hughes. Howls & Whispers (2). Howls & Whispers: The Averse Sephiroth and the Spheres of the Qlippoth (2). Hod: Sephira 8: Glory. Reverberation. Hod is the place where the first awareness of powers beyond human control come to the one who has become newly self-conscious through Yesod. At Hod, the mind begins to look outwards, to question our place in the world, and to turn to whatever inherited words and wisdom echo our own predicament and will help us to know and understand it. At Hod, because there is no direct contact with the Upper Tree, we turn to the established scholarship of libraries, museums, history, science and mythology – all reverberations of ancient wisdom, and echoes which may be as tricky and deceptive as Mercury, whose energies flow through Hod. Mercury is the messenger of the gods, and communication is an important part of the energies of Hod. So, we encounter information about the great super-human forces of creation and destruction which, it often seems, govern our lives. We look for ways by which to understand these powers; the patterns in which they function; and the rules by which they seem to operate. And we discover the ‘Laws’ which have been laid down by our family, our ancestors, and our society in order to help us all survive. The position of Hod, on the ‘passive’ Pillar of Form on the Sephirothic Tree, means that our relationship to learning is cerebral and theoretical. And, since Hod is only one part of the mirrored energies of the Supernal Triangle of Kether, Chokmah and Binah (the other two being Netzach and Yesod), its energies alone cannot turn our learning into understanding. The danger is that we mistake learning for understanding, and believe that by strictly complying with the laws passed on to us by the wise, order will be maintained and we, too, will be wise. The Illusion of Hod is order, and its Qlippoth is Rigidity. If the abstract, cerebral world view we acquire through Hod is false (and we may use our learning, rationality and powers of communication to rigidly justify and defend it), then whatever order we appear to have established is an illusion which must be shattered if we are to progress towards Truth. In ‘The Hidden Orestes’, Ted (still, in the poem, at the unenlightened, developmental level of Hod) interprets his world according to the patterns of Ancient Greek mythology. This is entirely consistent with his early acceptance of the views on religion, poetry, and the poet’s role which are expressed by Robert Graves in The White Goddess1. It was no doubt coloured, too, by his studies of early religions and shamanism in the Anthropology he read at Cambridge. And, certainly, there are parallels to be found between the pattern of events in The Oresteia and the pattern of some parts of Ted’s life with Sylvia: enough, perhaps, for him to interpret his own life in terms of the eternal working out of Divinely ordained ‘Laws’. The Oresteian Tragedies were written by the poet Aeschylus some time between 525 - 456 BC. In these plays, the relationships between the gods and man is explored, demonstrated and rationally debated. The poet based his story on the history and legends of his people and on their religious beliefs. And his characters acted out theological and ethical dilemmas which were echoed in the emotional, mental and civic lives of his Athenian audience. In the end, Aeschylus’s drama supported the established order of the Athenian State, but the issues he presented are still fundamental to the way we understand our own world and live our own lives. And one of the main issues dealt with in the plays is that of free will. By interpreting his own and Sylvia’s lives in terms of an ancient, continuously repeated pattern, Ted suggested that all the tragic events which befell them were decreed by ‘Fate’. If they, like the family of Orestes, were victims of a curse which they had inherited, then nothing could have been done to change anything: Fate decreed the events, and the order of these events was, so to speak, rigidly imposed. Yet the Classical Greek pattern which Ted wanted to impose didn’t quite fit: as the last nine lines of Ted’s poem admit. Ted, befogged by love and following the customary patterns and expectations of his tribe, is certainly like the unwary “buffoon“ who was, reportedly, married to Electra on her step-father’s orders. Sylvia, too, is like Electra in that she wanted to ‘kill’ her mother, because she believed that her mother was responsible for the death of her beloved father2. And Sylvia’s mother, like Clytemnestra, fits the role of a “banshee”, who heralds the release of deadly maternal Furies on the husband she regards as “the guilty one”. But, unlike the pattern of deaths in the Oresteian House of Atreus, it is the daughter, Sylvia, who dies, not her mother; and it is the daughter’s husband who becomes the accused. Acting the “befogged buffoon”, Ted, “cannot make out“ why Sylvia is so driven and so jealous of other women. And he is “alarmed“ by her sudden mood changes – her seemingly “demonic“ response to some simple, natural thing. But, as he says (rationally justifying his Hod-like passivity), he is “not to know“ what is behind all this or what it portends. This excuse, too, is a defensive response to his feelings of helplessness. He wants to understand all that has happened and, because he seems to have been unable to control events, he tries to interpret everything according to a time-honoured pattern in which the gods are in charge of human affairs. But what he “will never get clear“ (or understand) by interpreting things this way, is why the gods appear to have got things wrong: why the old established pattern, which he has learned so well, doesn’t fit. The answer lies with the hidden Orestes at the heart of Ted’s poem. And it lies in the even older stories of creation, death and rebirth (stories of Heaven and Earth, gods and man, and shamanic heroes) which exist in every culture and which seem to be a reflection (or reverberation) of some fundamental universal pattern. Beneath the tribal history, story-telling level of Aeschylus’s drama, The Oresteia is but one more echo of this universal pattern; and Orestes one more shamanic hero who undergoes the necessary trials, and returns to his people with healing energies. Hidden at the heart of The Oresteia, as at the heart of Ted’s poem, are “the family emeralds”, which are the real jewels of wisdom3. Orestes is the “black panther“ who embodies the Goddess’s energies. He is the young king, like Dionysus, who kills and replaces the reigning king. But he also kills his mother, Clytemnestra, who, throughout The Oresteia represents the Mother Goddess. And for this crime against Nature, the Furies pursue him. Apollo, the Mercurial god of poetry, guides him according to Zeus’s instructions. Athena’s justice defends him. But the Furies, finally, are placated only by his rescue of the Mother Goddess (the image of Artemis) from the deathly land of the Tauris people; and in this rescue he is aided by his sister Iphegenia. The “Hidden Oresteia” in Ted’s poem is the Divine Spirit in us and in our world which, like Dionysus, violently “kills” or destroys the illusion of order. Such disruptive energies can cause madness or possession, as they did in the Maenads. And they do portend death, as a “banshee” “death-shriek” does, although real, physical death, rather than symbolic death, comes only to those who cannot, or do not, learn to find equilibrium in the ensuing turmoil. At a personal level, in Ted’s poem, there is Sylvia’s death and the maternal ‘Furies’ (in various disguises) which pursued Ted and forced him out of his passive state into an active search for answers. And readers who know something of Ted’s and Sylvia’s lives may well read events from that ‘story’ into this poem. However, Ted deliberately couched ‘The Hidden Orestes’ in impersonal and mythic terms, so that it is relevant to us all. At any time, the hidden Orestes which is the divine, Mercurial spark within us, may, like the panther which kills instinctively and naturally in order that life is sustained and renewed, set in motion a sequence of events which destroys the illusion of order in our lives. Those whose personal identity is closely bound up with the order they have established for themselves, may panic. Most of us will find a new equilibrium with which we are moderately comfortable until the next disruption. And a few will set out along the long and difficult path towards true understanding of their place in the world, and for wisdom which is based on a harmonious balance of learning and experience, knowledge and intuition, and which requires the active and continuous discrimination of illusion from the Truth. Qlippothic Sphere of Ghoreb Zereq. Netzach is the place where we are most influenced by our emotions, needs, feelings and moods. Like Hod, Netzach brings us only indirect communication with the Divine energies of the Upper Tree: but, unlike Hod, this communication is non-rational. It comes to us through feelings and intuitions, not through mind-governed learning or through our five bodily senses. At Netzach, this intuition of something beyond our purely physical and mental understanding makes itself felt as a need beyond the basic needs which are related to our physical survival. We have a feeling that something is missing in our lives – something which is necessary to our security and peace-of-mind but which we can’t quite identify. We look for it in many places – in our relationships with others; in our surroundings; in our occupations and pastimes; and, perhaps, in religion. But in our unevolved, spiritually unawakened state at Netzach, we look for it outside ourselves, rather than within us, believing that other people, material things, and even images and icons can provide us with all that is necessary to satisfy this need. In particular, since Netzach is governed by the Planet Venus and reverberates with the energies of the Goddess of Love, we seek to satisfy this unidentified need through loving relationships with other people. But, since the Vice of Netzach is Selfishness, such a relationship may be governed by our own desires, wants and moods, and may be totally self-centred. Yet, however self-focussed we may be about satisfying any of our needs, we are not ready to stand alone. Netzach is still part of the Lower Tree – still closely connected to the vegetative Kingdom of Malkuth – and we are still closely bound to our family, our society, our group. So, we turn to them for support, see ourselves as we imagine they see us or want us to be, and respond to the emotions, needs and desires which they project onto us, or which we imagine will satisfy their requirements of us. Such projection is the Illusion of Netzach, and the danger of it is that our personal identity becomes a mask based wholly on self-deception, illusory feelings and false judgment. Netzach, which is at the base of the Pillar of Force, belongs to the Element of Water. Water can be liquid or solid. It can change swiftly from a gentle and nurturing fluid to a powerful and destructive force. Netzach’s energies are similarly changeable and can be similarly polarised, swinging from glorious, involuntary vitality to Qlippothic life-denying rigidity; from love to hate; from lust to chastity; from ‘Victorious Beauty’ to the hideous ugliness of the Ghoreb Zereq, the demonic ‘Dispersing Ravens’ which inhabit Netzach’s Qlippothic Sphere. At the base of the Pillar of Mercy, Netzach is the seat of selfless love and compassion, but it can also be a place of merciless and unflinching severity. And, if the Qlippothic Illusion of Netzach prevails in us, it can be a place where we project our own view of the world onto others and interpret mercy as what we believe is best for their welfare: being cruel to be kind, we might say. The Laburnum tree in Ted’s poem, is a symbol of worldly love. It is a tree which, in myth and legend, is associated with Venus Aphrodite: and it was an important symbol of the powerful Love Goddess and of love and security for Sylvia. She associated it with her beloved father, calling it “my father’s bean tree” (‘Maenad’ SPCP 133); and, in ‘The Beekeeper’s Daughter’ (SPCP 118), she captured the sensuous, sensual beauty of this “Golden Rain Tree” which, as a bringer of life and death, exhibits (she wrote admiringly) “a queenship no mother can contest”. In June 1962, at a time when her relationship with Ted was seriously troubled, Sylvia still managed to write ecstatically to her mother of having six (she emphasized the number) laburnum trees in her garden in Devon, and they were obviously important to her. But there is only one tree in Ted’s poem: just as there is only one Goddess of Love. Sylvia’s need for reassurance that they would “sit together this summer / Under the laburnum”, shows how insecure she felt in the midst of the changes and the emotional turmoil as their marriage foundered; how much she wanted Ted to “tell her” their love would survive; and how important and magical a talisman the laburnum was for her. Ted’s “Yes” is repeated four times, to represent stability and to confirm his intent5, but this was as self-delusory and non-rational a response as Sylvia’s demand that he say it. And the laburnum’s deathly, corpse-like aspect in the two lines which follow this reassurance, indicates the deadly untruth of such an exchange and the destructive pattern of such self-delusion and emotional misjudgment. The following lines, too, indicate the spiritual nature of the change and sacrifice which must take place if Truth is to be found and the true Self awakened. The “clock” of the laburnum is “stuck at noon” – at mid-day, when the sun reaches its zenith before, as in mythology, dying and falling into darkness. The laburnum’s “full” sun-yellow flowers mimic the fullness of the mid-day sun, and they presage the natural Autumn growth of the tree’s poisonous seed pods, and (for the tree in Ted’s poem) its own un-natural death. So, it is both Midsummer – the traditional time for ritual bonfires and sacrifice – and “noon”. And the fourfold repetition of “noon” in Ted’s poem not only carries echoes of ‘bloom’ and ‘doom’ (suggesting the continuous cycles of birth and death in nature), it also encompasses the sound, ‘oo’, which in many spiritual traditions is identified with the Divine Source, and it embeds that spiritual vibration in Earth 6. But “who dug up the laburnum?”. Who interfered with the natural cycle of death and rebirth? Who usurped the Love Goddess’s place in Sylvia’s life and ensured that death and darkness would prevail? Ted suggests that it was “They”, who were “far off” and whose words “sawed” and “chipped” at Sylvia’. “They” who, as if embodying the voracious cravings of the demonic ‘Dispersing Ravens’ of the Qlippothic Sphere of Netzach, carefully sharpened their “little teeth” and destroyed Sylvia’s love by telling her “exactly what they thought she should know”. “They” projected their views of the world onto Sylvia, and she responded to their emotional vehemence. Instead of trusting her own instincts, she not only allowed their anger and revenge, and their plans for her future, to cut and shape her but she “probably” encouraged them to do this. Sylvia correctly identified her need as “the truth”: she wanted, “Only the truth”. And she was willing to endure pain to find it. But the demons which exercised their cravings through the “They” of Ted’s poem, and through the “hands and “fingers” of her mother, filled her with “revenge” and a vision of “a future” which she “could not find in” herself. So, she adopted a mask and projected what “they wanted” into her world. “They” (still unidentified in Ted’s poem) “tore up the laburnum”. And “They” showed her “the raw hole” and the broken “roots ends” which were the truth of her sacrifice, and which prophetically indicated the truth of her future, premature death. “They” were merciless, and their concern for Sylvia’s welfare was a perverted form of love. But Sylvia’s own turbulent emotions, her fragile sense of identity, and her habit of relying on those she loved for support, allowed it to happen. And Ted, in his own immature, unawakened state at Netzach, slept soundly whilst “The laburnum fell”7. “They” dug up the tree: but in a sense both Ted and Sylvia were responsible for its death. As Ted’s poem suggests, the rooting out of false values based on emotion and on worldly, material things, is necessary for those who seek the Truth: but it must be done with the utmost care. And there is a broader meaning to the poem, too, which is consistent with Ted’s concern for our treatment of the Goddess and our blindness to the damage that we do to nature. We must recognize that our true roots lie in the earth to which we must, ultimately, return. Our earth-bound roots, like those of the laburnum, are a fragile, easily broken, life-supporting network, for which we are all responsible. We should not let others show them to us “broken in air”, for this truly entails our own death. We must not rely on what others tell us about matters which are essential to our own survival. In Cabbalistic terms, we must somehow learn to use the energies of both Hod and Netzach without losing touch with our roots in the earthy sphere of Malkuth. The Wodwo’s question, “What am I?” reflects our first, primitive need to understand our place in the world. It is this question which first leads us towards the light; and, like Wodwo, we need to understand our connection with “roots/ roots roots roots” 8. Only this way can be become whole, fully evolved human beings and discover our true Self. Virtue: Devotion to the Great Work. Tiphereth is the most difficult of the Sephiroth to describe. 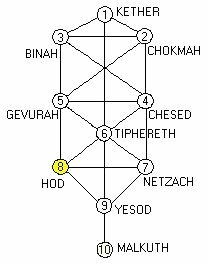 It lies at the heart of the Sephirothic Tree on the central Pillar of Equilibrium, and it is at the heart of a complex of six Sephiroth which represent Adam Kadmon, the archetype of Primordial, Universal Man, in whom all the energies are harmoniously balanced. To cover all the aspects of Tiphereth is, as Colin Low puts it “to cover most of Kabbalah”9. In terms of the human journey up the Path of Wisdom, however, Tiphereth is the Sephira which makes the difference between our remaining on the lower levels of the Tree, at a wholly material level of existence in the World of Assiah, or taking our first step into the upper levels of the Tree and, for the first time, making direct contact with the Divine Spark within us. Tiphereth is a centre of transition and transmutation. It is the place where inner and outer consciousness touch. And it is the “Place of Incarnation” of the Divine Child in us: the “nucleus of manifestation” of our “higher self”10. 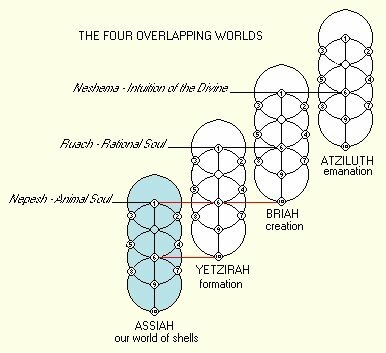 In the overlapping pattern of the Four Cabbalistic Worlds, the Tiphereth (Sephira 6) of the World of Assiah overlaps Malkuth (Sephira 10)in the formative World of Yetzirah: so, we may receive the energies of both these Worlds. Our first exposure to the higher energies of Yetzirah represents an awakening of consciousness which, in our unevolved, immature state on the lower Tree, may be so sudden and so intense that it is overwhelming. The Sun of Tiphereth may blind and burn us. Yet, its light should bring us new and direct insight into our essential nature: a new, illuminated glimpse of what lies, like a buried seed, beneath the rational, emotional, sensual persona we have learned to project to the world as our identity. Dion Fortune writes that “there is a certain emotional concentration and exaltation which makes the higher phases of consciousness available, without which it is impossible to attain them”; and she likens this to a “burning fire” in which “all the dross of the nature” is consumed11. She writes, too, that “by the very nature of the human mind, with the brain as its instrument, this white heat cannot endure for long”, and, whether it brings pain or ecstasy, it dies away and exhaustion and, perhaps, emptiness ensue, Nevertheless, the mind has undergone “an expansion that never wholly retracts”12. In the first twelve lines of ‘The Difference’, Ted describe this process exactly. The emotional and physical collapse as this uncontrolled and uncontrollable “epileptic” ‘seizure’ takes place, are typical of the sudden stripping away of the persona which the energies of Tiphereth can effect. The masks are suddenly gone, like “a dress ripped off”; the past is “wrenched open”; and what is revealed is the core of the inner being. It is what we are born with; the result of what has been; and what, ultimately, is the source of our deepest needs and strongest drives. To experience such a moment of Truth is intensely personal. But Truth is absolute and universal. So, ‘she’ and ‘he’, in Ted’s poem, might be any couple, although the revelation each experiences is interpreted in worldly terms according to their own lives. We may conjecture that ‘she’, in Ted’s poem, is Sylvia. And, in the light of Sylvia’s letters and journals, and other scraps of information we may have about her life, we may further conjecture that the things which Ted describes in the first part of the poem took place early in their marriage. Ted and Sylvia were married on June 16th, 1956. Some time in June Sylvia received an unexpected letter from Richard Sassoon, in which he explained his apparent abandonment of her after a love affair which had lasted from 1954 until March 1956, when she had expected to meet him in Paris13. But “Dickie”, in Ted’s poem, may or may not refer to Richard Sassoon. And the subject of the parenthetical phrase “not his name” may, ambiguously, be either “Dickie”, or the “he” of the poem who is suddenly “out of his depth” in at least one of the roles he has chosen to play in this relationship. Sylvia wrote poetically and ecstatically in her journals about her love affair with Sassoon. Her “mystic vision with Sassoon” became part of one of her stories, and part of a diary entry on 9 March, 1956. And in January 1956 she wrote, “We together make the world love itself and incandesce”(SPJ 15 Jan. 1956). Yet, even as she expressed her passion for him, she criticized his lack of “healthy physical bigness”, and longed “for someone to blast over him”(SPJ 25 Feb. 1956) and replace him as her idol. On April 18th 1956, even as she longed for Ted, she wrote to Sassoon accusing him of “brutally” deserting her just as her father did when he died, and she blamed him for the “superfluous unnecessary and howling void” his long absence had caused her. The “choking / Revelation as of knotted lovers / Lifted from Pompeii’s ashes”, which, in the ambiguity of Ted’s poem both “she” and “he” see, and which leaves them both “shaken”, is described in realistic terms and can, if we wish, be linked with the “knotted” lives of particular individuals. But the revealed truth of Tiphereth is that even the closest union of male and female cannot survive if it is based on masks and self-deception. Nor can any human relationship, however loving and close, wholly satisfy the needs of the Divine spark within us. “He” and “she” in Ted’s poem are both, momentarily stripped of their masks and illusions, and both are changed by it. She has “The blame stunned our of her”; he sees an aspect of her that he has never seen before, and sees his perceived role in their relationship, “not only as a doctor”, undermined. And, because of the careful imprecision of grammatical structure in the sentence which begins with “shaken” and ends with “survival”, both he and she survive by the “skin-of-the-teeth”. This was the first difference that the energies of Tiphereth made to these lovers’ lives. But it “was nothing” to the difference which occurs in the final six lines of the poem and which, although seemingly rooted in historical events, is expressed in metaphorical and visionary terms. Sylvia’s awareness of her need for union with a strong male who would replace her father is frequently expressed in her journals, as was her need to write. And eventually she brought these two needs together in her marriage and in her poetry. So, she combined the worldly, loving, heart-felt Tipherethic energies of the World of Assiah with the artistic and formative energies of the World of Yetzirah. The Sephira at which these two energies overlap on the Sephirothic Tree, however, is Malkuth in the World of Yetzirah, which is still governed by Saturn, the Father, and is still the Qlippothic realm of Lilith and her demons. Sylvia’s poetic purpose was to get “back, back, back” to her Daddy; to poetically banish her personal demons and, thus, to forge a new, whole, identity for herself. But she allowed the Vice of Tiphereth, which is Pride and Self-importance, and the worldly energies of Assiah to direct her Great Work towards material goals. And she succumbed to the temptations of the demons of Malkuth when she imagined that she was strong enough to fly (metaphorically) to the sun on Ariel. Also, believing herself to be stronger than she was, she poetically recreated herself as the Bee Queen and declared her independence14. By doing so, she challenged the jealous Goddess and, also, cut herself off from the protective energies of Abba, the All-Father of the Upper Tree. This was an act of hubris for which she paid dearly. Her poetic flight brought a glimpse of Truth, and it was a creative victory, but she was burned up, exhausted and alone. So, in Ted’s vision in the final part of his poem, she is carried off, like Persephone, by the Father God of Earth. The difference between “her” first exposure to the transformative energies of Tiphereth and this last one, was the difference between skin-of-the teeth survival and death. The difference between the changes “he” physically “watched” and experienced on that first occasion, and the “seeing” which Ted (the mature ‘Watcher’, fully conscious at Tiphereth) described in the last part of his poem, was a difference between “nothing” and everything. In a Tipherethic vision born from his innermost nature and shaped by all his experiences, Ted glimpsed the Truth and gained a new understanding of all that had happened. Given the Cabbalistic framework of Howls & Whispers, it is not unreasonable to suggest that Ted’s vision of Sylvia “forever” grasped in the arms of the “huge-eyed” stranger and trapped in the darkness under “the floor” of his world was what drove him to attempt the difficult, healing journey which he undertook for both of them in Birthday Letters. But it was also his understanding of the crucial difference between these two Tipherethic experiences which made him aware of the dangers of letting his own personal and worldly needs outweigh the spiritual and universal aspects of The Great Work. 1. Ted was given a copy of The White Goddess by a master at Mexborough Grammar School; and, as Faas comments (UU 71), it “had already turned into a kind of Bible” for Ted when he was writing his earliest poems. 2. All this is consistent with Sylvia’s own words in her journals and in her poems. 3. ‘Emeralds’, perhaps, because the wisdom of Hermes / Mercury (whose energies rule Hod) was found, long ago, inscribed on an emerald tablet (the Smaragdine Tablet), which begins: “In truth certainly and without doubt, what is below is like that which is above, and what is above is like that which is below, to accomplish the miracles of one thing”. This belief in the unity of all, is the hidden light which underpins the traditional arts of Alchemy and Cabbala. 4. Ted Hughes, Aeschylus: The Oresteia, Faber, London, 1999. 5. Four is the number of Earth and of the four Elements of which all things are created. We speak of the four corners of the Earth; of the four seasons; and four brings everything together in ‘four-square’, material stability. 6. Cabbalists not only believe in the spiritual power of particular words (especially those which represent the Divine Source), they also believe that the sound vibrations of each letter have specific spiritual energy. It is quite likely that Ted intended the letter ‘n’, which brackets the vibrations of ‘oo’, to give each repetition a particular magical power and, depending on the tone in which the word ‘noon’ is pronounced, that the four-fold repetition may link Divine and human energies in each of the four Worlds of the Cabbalistic Tree. 7. In terms of Ted’s own quest for understanding and truth, the Goddess’s tree was still “strengthening” at this time of his life. In his own dream world of illusion and folly, it was “barely” halfway through winter, and the midsummer noon of burning and sacrifice was yet to come. 8. Here is another fourfold, earth-associated repetition, this time from quite early in Ted’s work. It suggests that he was already aware of the magical power attributed to numbers before 1961, when ‘Wodwo’ was first published (New Statesman, 62: 347,15 Sept). Ted would have appreciated the coincidence that ‘Wodwo’ appears on page 183 in both Wodwo (the Faber, paperback edition) and Ted Hughes Collected Poems. Curiously, too, 183 + 183 = 366, and this reduces to 6 – the number of Venus, the Goddess who rules Netzach: alternatively, 183 on its own reduces to 3, the number of the Triple Goddess. Coincidence? Or another reverberation of the Platonic harmonies? 9. Low, Notes on Kabbalah, p. 52. 10. Fortune, The Mystical Qabalah, p. 182 - 3. 11. In Alchemy, too, the impure elements of the prima materia must be burned away in order to reveal the seed of pure Gold which belongs to the Sephira of Tiphereth. 12. Fortune, op. cit. p. 190. 13. Middlebrook, D. Her Husband, Viking, USA, pp. 45 -6. 14. She does this in her ‘Bee poems’, SPCP 211 - 219.